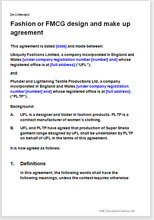 A contract for a fashion or FMCG business, for design and make up. Use for clothing, shoes, non-regulated medicines, cosmetics, toys, nursery products and many more. Manufacturer may be home or abroad. Professionally drawn and very thorough. Design ideas and details of work to be attached by you or entered in schedule. It is an umbrella version suitable for either a single instruction, or for multiple or continuing orders. This agreement is for you to send your designs and ideas to a company who will complete the design, send samples to you for approval, pass your stringent tests, comply with national or international standards and ultimately make up to your order. It could as easily be used for any fast moving consumer product like cosmetics, toys or household goods. We cannot hope to think up the specification for every possible product. We leave it to you to provide your specification for design, finished product and standards to be achieved along the way. Assumes your intellectual property is of great value and must be protected. Manufacturer’s warranties - who they are, what qualifications they have.